SecretUI » AddOns » Hot Keys » FoolItem - Hot Key Gadgets and Potions! 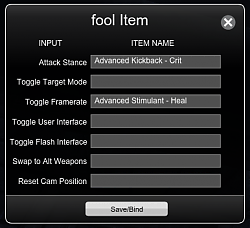 FoolItem - Hot Key Gadgets and Potions! Want to hot key your items without using a third party macro tool? It's now possible with this simple to use UI mod. Upon installing this mod a small button will be placed next to your Top Menu (in the top left of your screen). Click the button to open main interface of the mod. Here you will notice inputs in the first column, and place to assign an item in the second column. 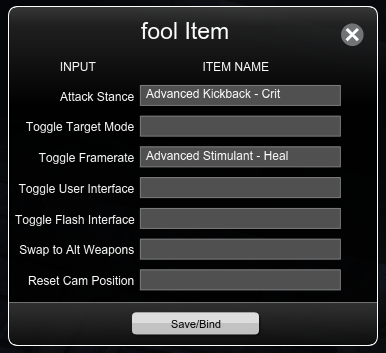 Simply type in the items you wish to use and click the Bind/Save button. While it may be possible I was unable to add my own 'inputs' to the game, as a result I have to hijack exiting inputs that already exist. So for example if you rebind the "Toggle Framerate" so that instead of displaying your frame rate it will instead use your item. Once you've rebound the input you can then go into Settings -> Controls and rebind "Toggle Framerate" to any key combination you'd like. "Shift+1" for example. Now you can simply press Shift+1 to use your potion or gadget! I've provided 7 inputs for you to rebind so that you can pick and choose as you'd like. If you'd like to return the bindings to their original function simply blank out the text and restart Secret World (sorry guys, no way around the restart). Also big thanks to Catagorical who's sample UI I picked apart and put back together to learn what I was doing. Fixed saving/loading configs when switching characters. Hi, just tried this addon and loved it, however the entire time I had it installed I would frequently lose control of autorun i.e. my character would start autorunning automatically, could not stop or turn off without relogging. Also, sometimes I would start spinning to the right, and with no ability to stop or turn off without relogging. After removing the mod, zero issues, which is really too bad because I loved the concept. I do run several other mods, Vipers Castbar Relocator, Deck Manager, Topbar Information Overload, Add-on Manager, so not sure if there's a conflict somewhere. If you have any ideas as to why this might be happening, I would love to try and get it fixed if possible. Any chance you could show what each slot is currently bound to so we know at a glance what they are? It would be great if you would add an ability to move the icon, because on 1920x1200 its somewhere below the menu and hovers in the middle of nowhere on top of other windows like wheel. I have the same problem. In which game resolution can I see the icon? or simply turn alpha off and use script cmd to open it. This addon is a gold nugget, thanks for the work !